Happy Wednesday! This morning I had a decent run, but I had to cut it shorter than I wanted because I’m headed out for a meeting. 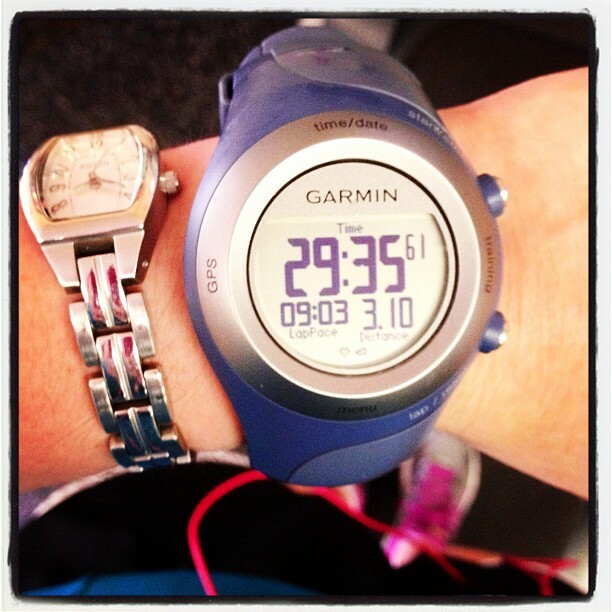 I also forgot to turn my Garmin on for the first couple minutes, so I ran a little farther than this. Since it’s Wednesday, I finally decided to do my first What I Ate Wednesday (WIAW) post! 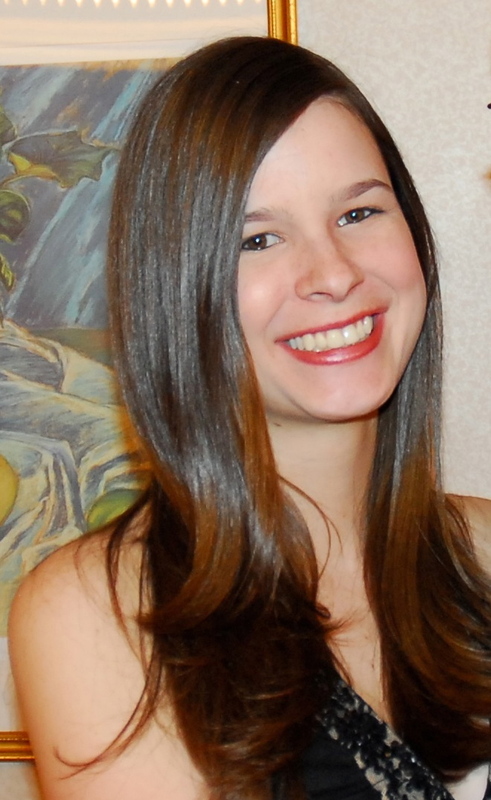 If you read healthy living blogs, you’ve probably seen a lot of other people participating in WIAW. It’s hosted by Jen over at Peas and Crayons. Basically, it’s a food diary where you photograph everything you eat one day. I must warn you, I’m a snacker, so my WIAW is more snacks than meals! If you find it boring, you can skip to the end because one of my daily eats was a delicious new recipe that I’m sharing. Here goes my first WIAW! 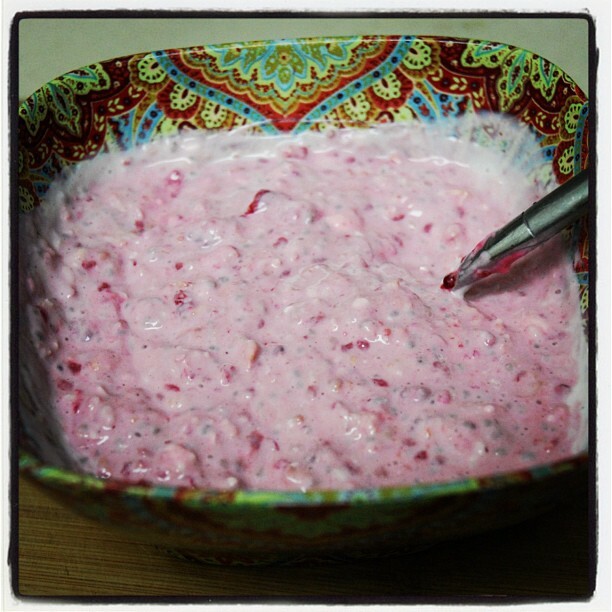 My breakfast was my usual Nutella Overnight Oats (recipe here) with raspberries instead of bananas. For lunch I usually have multiple snacks (spaced out). 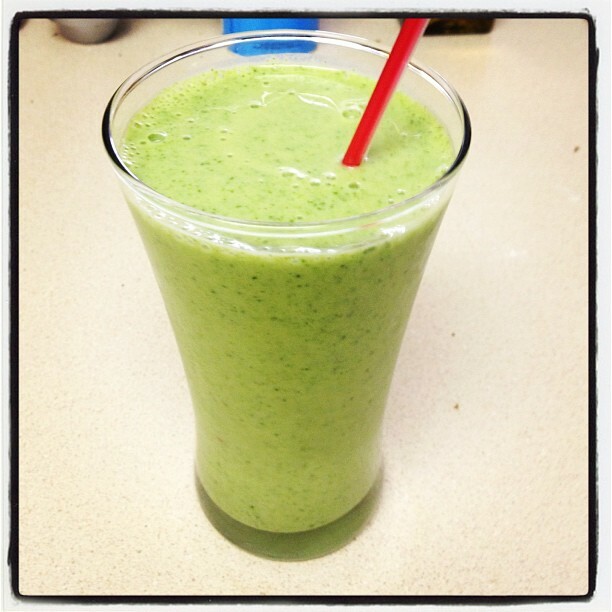 Today I had an Orange Creamsicle Spinach Smoothie (recipe here), Whole Wheat Homemade Cheez-Its (recipe here), Carrot Fries (recipe at the end of this post! 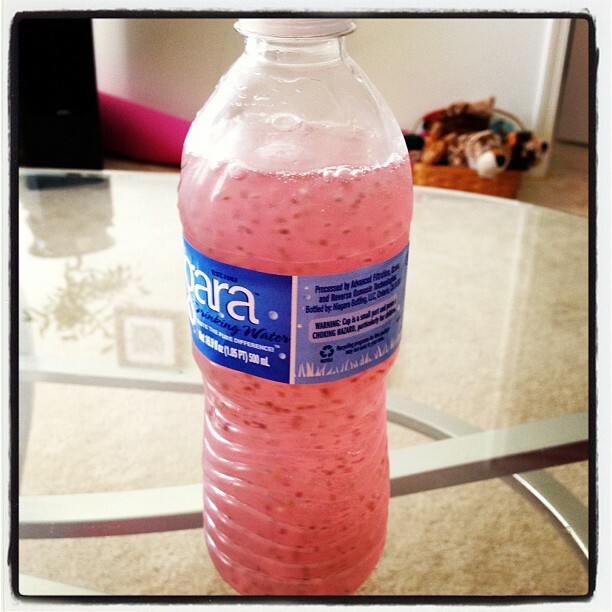 ), and lots of water plus a strawberry lemon chia drink that I made myself. I also had some un-photographed chips and homemade guacamole. 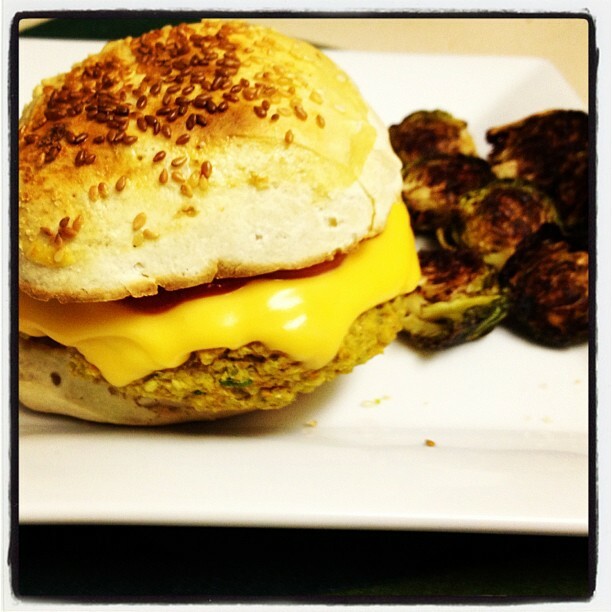 Dinner was a delicious quinoa burger (a new recipe that I will be posting soon!) and some roasted brussels sprouts on the side. Let’s backtrack to those carrot fries I had as a snack this afternoon. I love sweet potato fries. I love parsnip fries. Parsnips are like carrots. So I thought, why not try to make carrot fries? Well, I did! And they were amazing! They may even be my new favorite of the three. You make them just like the others. Waiting for them to finish baking is the hardest part. Other than that, they are easy peasy! 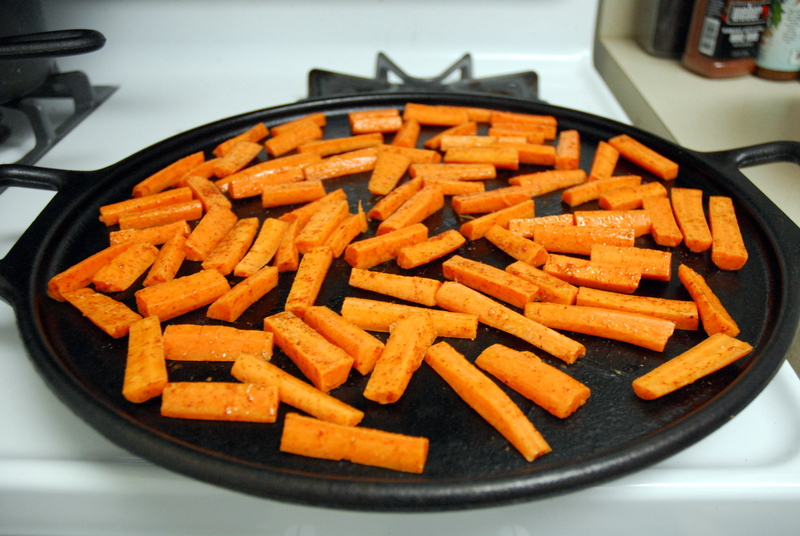 Just chop your carrots into rectangular fry shapes and preheat your oven to 425. Then place them in a large bowl and toss them with the olive oil, cornstarch and spices. 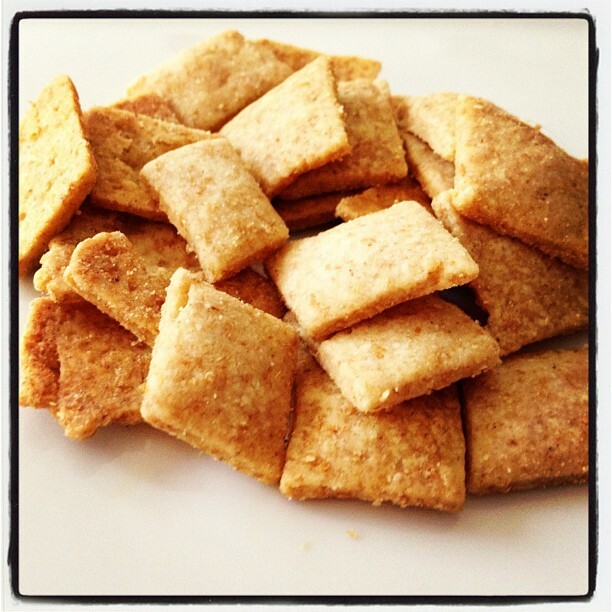 Spread them out on an oiled baking sheet and bake at 425 for about 40 minutes, flipping halfway through. any other spices you want to add! Peel the carrots and slice them into rectangular fry shapes. Place them in large bowl and toss them with the olive oil, cornstarch and spices until well coated. 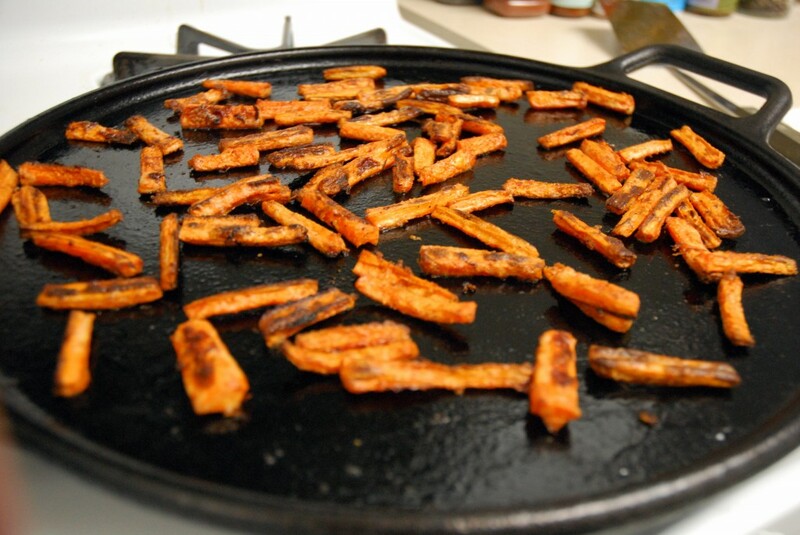 Spread out the coated fries on a greased baking sheet and bake at 425 for about 40 minutes, turning once. 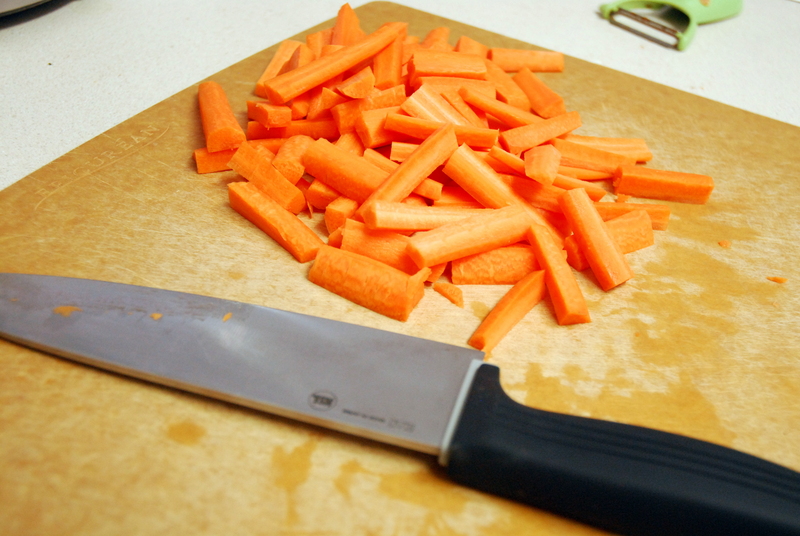 *Check them after about 30 minutes – depending upon how thinly/thickly you cut them, they may need more or less time. This entry was posted in Gluten-free, Recipes, Sides, Snacks, Vegetarian and tagged carrots, fries, gluten-free, Snacks, vegetarian, WIAW. Bookmark the permalink. Root veggie fries are the bomb. Have you tried parsnip fries yet? Yes I love parsnip fries! 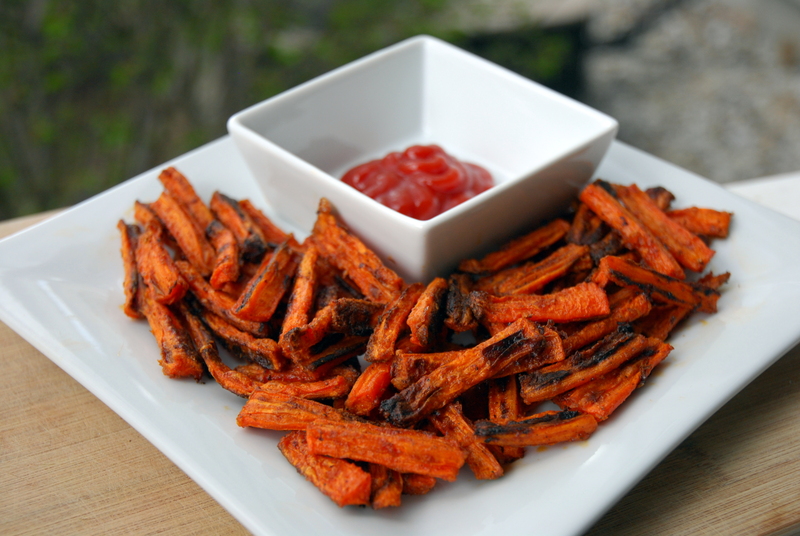 That’s what gave me the idea for carrot fries – not sure why I had never thought of it before! 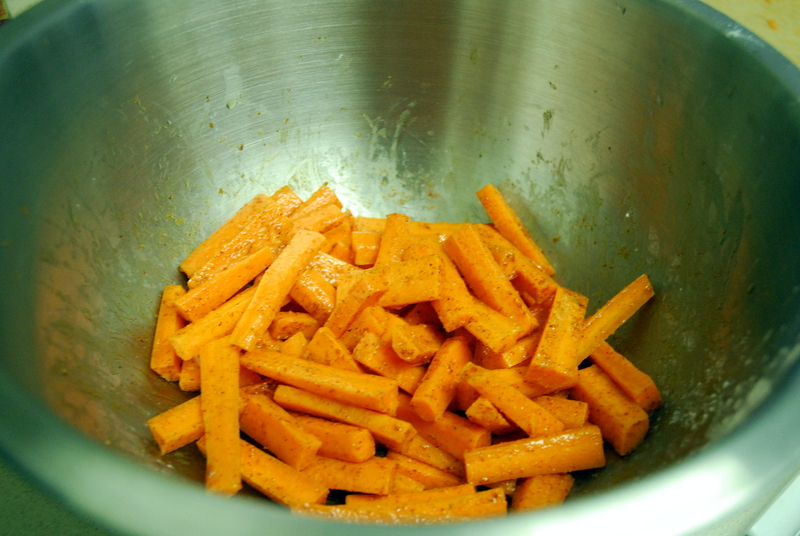 I need to make carrot fries! You are the second blog I have read that has made them that I have read today! I’ve never tried carrot fries. I have no idea why! Everything looks delicious!! Farrah recently posted..WIAW- Full on Spring! You have to try them! They are so good! 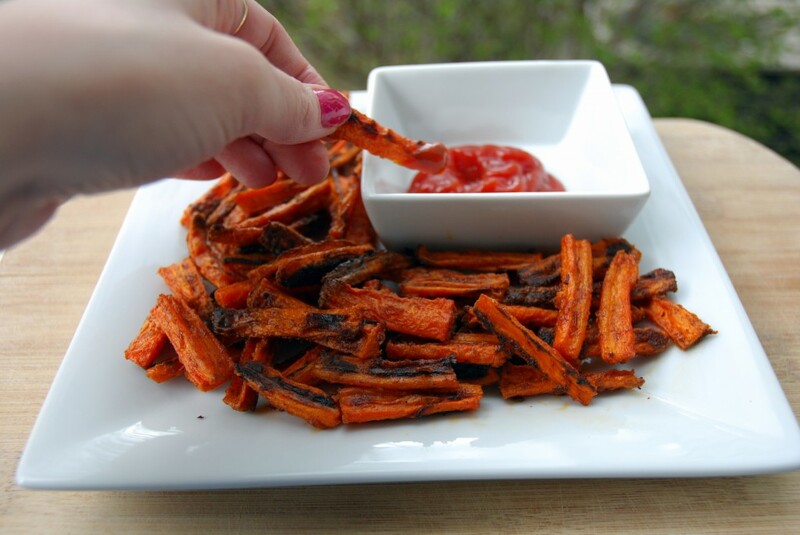 yum i’ve never had carrot fries – look like such a great treat! I’m sure I’ll try them with cayenne soon! I love experimenting adding different spices to fries! The burger sounds awesome…I can’t wait for the recipe! 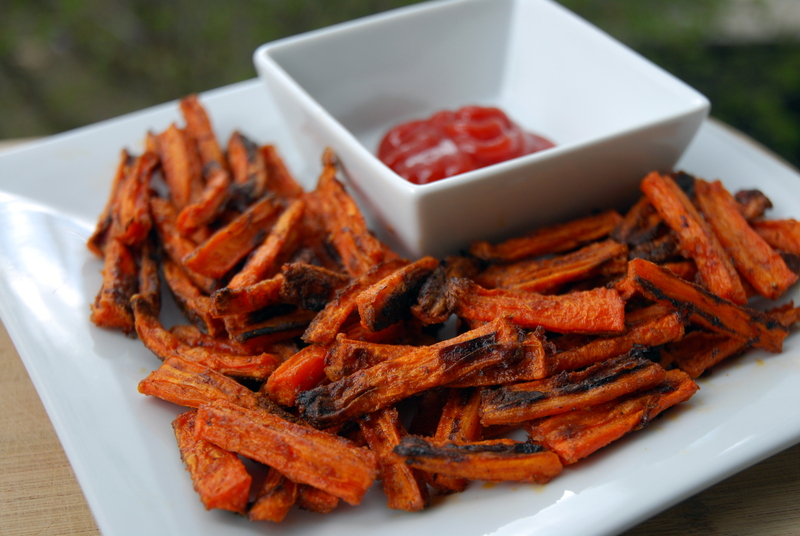 I’ve never had carrot fries either, only the sweet potato variation. Gotta try that, thanks! Give parsnip fries a try too – they’re also tasty!